Originally called Tyler's Prairie or Tyler, Texas, the community dates to a Mexican Land Grant in 1835. In 1855 the land was purchased by A. F. Westall and Daniel Daily (also spelled Dailey) with Dailey buying out his partner in 1859. A Baptist church was built in 1860, first named Salem and later becoming the Pennington Baptist Church. Daley platted the townsite in 1866 and named it after the town's first storekeeper, Hugh (or Hill) Pennington. A coeducational school (Pennington College) opened its doors in 1866 and stayed in operation through 1882, changing its name to the Steele Academy sometime between those dates. (Daniel Webster Steele was a teacher who became the school's president). 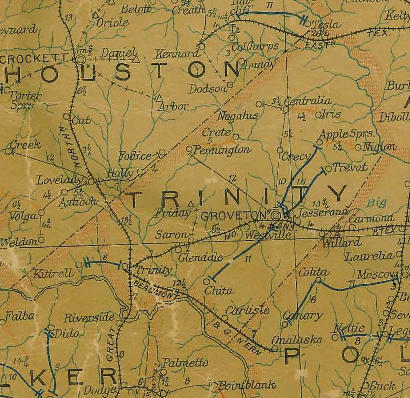 The town was granted a post office in 1873 and became the Trinity County seat shortly thereafter, taking it from Trinity, Texas, a railroad hub and timber center in the southern end of the county. The population has been estimated between 1,000 and 1,500 residents in the late 1870s / early 1880s. Pennington had no railroad and when the county seat was changed to Groveton in 1882 (coinciding with the closing of the Steele Academy) the writing was on the wall. By 1904 the population had dropped to less than 300 and as late as 1990 maintained 100 residents which has since declined (2000) to a mere 67 people. According to the �Texas State Historical Association�, Pennington, TX, once known as Tyler�s Prairie, within the 1835 Mexican Texas Land Grant, is near the Davy Crockett National Forest. The community was incorporated in 1901, but became unincorporated by 1904. A likely reason that growth diminished was due to the lack of a railroad and the movement of government to Groveton. 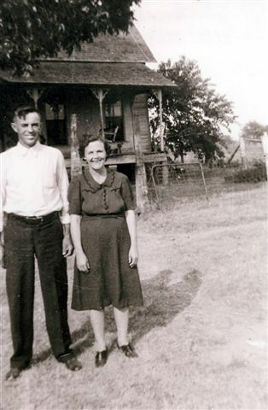 In the 1920�s, grandparents John and Allie Madden share-cropped on the �old Mile�s Place�, on US Hwy 287 towards Crockett from Pennington. 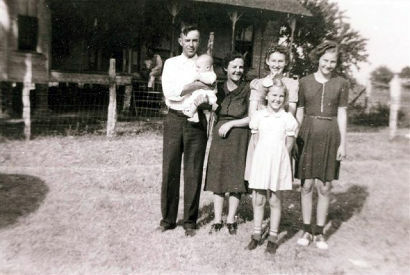 Children Lois, Honor, Earline, Johnnie Faye, and Wyatt Dean attended school in Pennington. When Earline completed school in 1940, there were about a dozen in her graduation class. The community had a post office, feed store, caf�, and several other small businesses. Nearby is the Pennington Baptist Church and the Pennington Cemetery. A number of the Madden family members have gravesites there. In later years, John and Allie moved east of Pennington on FM 358 and bought forty acres on which to farm. Nearby, the Reynolds operated a gas station and a store selling basic food necessities. Farther down the road lies the Possum Walk Cemetery, where a number of Allie�s relatives, the Mabry line, have gravesites. John had two horses that were used to pull the hand plow for tilling the land for planting. He and Allie grew corn, peanuts, and potatoes as major crops and vegetables for table use and canning. A few cows provided milk, a few hogs were raised for slaughter, and chickens provided meat and eggs. A pond provided an occasional fish or two. Neighbors would often barter and trade to supplement their stores of goods throughout the year. When we went for visits, the route usually taken was through Trinity and Groveton to reach Hwy 287. Traveling in the direction of Crockett, we would turn off on the �old red road� (don�t know that I ever knew its proper name) which led to the corner of the Madden property on FM 358. One Thanksgiving, with family gathered, a turkey was placed in the oven on low heat and cooked overnight. The next morning, the house was filled with the aroma of baked turkey. What a delight! We can picture John, sitting in his rocking chair on the front porch, waving at passers-by in their cars. Allie always had smile and a cheerful greeting for guests. Those are lasting, pleasurable memories.